Glacier Hydrologist Maxime Litt works on the Morimoto precipitation station in Langtang Valley. 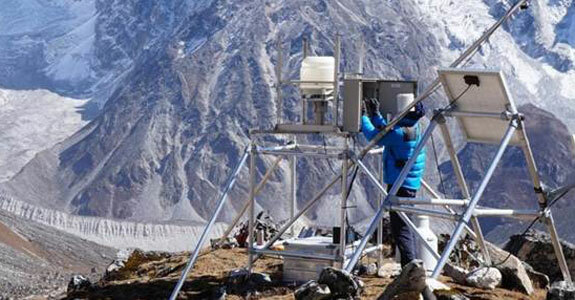 A small team of ICIMOD researchers recently returned to earthquake-ravaged Langtang Valley to rebuild and maintain the network of hydrological and meteorological stations that was partly destroyed by the 25 April Gorkha tremors. As the lower portion of the trail was destroyed by landslides and rockfall, the new ‘high-route’ to Langtang took the team from Syabrubensi up to Sherpagaon, and then back on to the main trail at Rimche. From Rimche to the main upper village of Kyanging Gompa, the Langtang Valley was essentially deserted. The roar of the Langtang Khola was interrupted only by our heavy breathing as we climbed past tea-houses and hotels damaged by the earthquake and rockfalls. At Ghodatabela, 4 km downvalley from Langtang Village, we saw first evidence of the magnitude of earthquake destruction on the opposite valley walls. Here, mature forest was stripped and toppled by the massive air blast that preceded the ice, snow, and debris avalanches (http://mountainhydrology.org/nepal-quake/landsat-8-reveals-extent-of-earthquake-disaster-in-langtang-valley/). Continuing upvalley, the devastation became more apparent. Twisted sheets of tin roofing and lumber were scattered across the landscape. At the former site of Langtang Village, the 9 May 2015 rockfall masked all previous signs of human habitation with a thick debris-layer, though the earthquake-related avalanches had stripped houses to its bones and thus left little to cover. A few prayer flags fluttered in the valley breeze, and the waterfall-fed river that used to power a small hydroelectric plant still flowed into the debris. We raised some prayer flags of our own, and remembered those who lost their lives in the earthquake and its aftermath. The team continued upvalley, and we spent 10 days to repair broken weather stations, replace broken sensors and solar panels, and conduct surveys of surface height change of the debris-covered Langtang and Lirung glaciers with an unmanned aerial vehicle (UAV). We scrambled along moraines to visit and maintain precipitation stations at 4,500m above Langshisha Kharka and Morimoto Basecamp, stood in the near-freezing waters of Langshisha Karka to measure water flows, and spent two nights at the base Yala Glacier (5,100 m), where the absence of recent snow cover indicated a very warm monsoon season. Having revived the weather stations will provide data to understand patters of temperature and precipitation changes and how this influences glacial melt in the valley. Though the valley and its inhabitants are still reeling from the earthquake, Langtang Valley remains as impressive and awe-inspiring as it ever was. ICIMOD will continue to support the people of Langtang through ongoing scientific research and outreach.